Gentrification is one of the main reasons behind why more poor District children now live in wealthier neighborhoods. Such neighborhood revitalization, which brings along amenities that children can benefit from, also increases property values. As a result, low- and moderate-income families renting at market rates may get priced out. Those living in public housing, however, could be somewhat buffered by the negative impact of rapid gentrification, since rents remain steady. Take Columbia Heights, where public housing apartments are on the same block as million dollar homes. 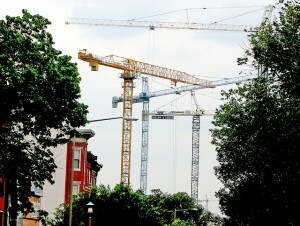 But good luck to anyone seeking public housing — the waiting for affordable housing vouchers in the District has swelled to more than 37,000-people long. 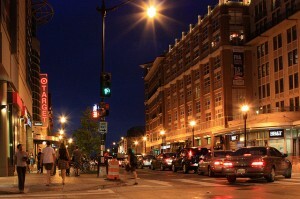 Columbia Heights is an economicaly diverse neighborhood, home to luxury high-rises and public housing. Researchers have long noted the ills of growing up in a neighborhood of concentrated poverty — graduation rates are higher lower, access to healthy food is more limited and violence is more common. “Neighborhoods of concentrated poverty are really hard on children,” said Gwen Rubenstein, deputy director of DC Action for Children, who ran the recent Kids Count report that found that concentrated poverty has dropped in D.C. She noted that children from upper and middle class families who live in high-poverty neighborhoods have an increased chance of being poor as adults. But do poor children benefit if they live in neighborhoods of concentrated wealth? It’s a question that hasn’t been explored much in D.C. but one worth asking, given that the city’s childhood poverty remains high — one in three District children lives below the poverty line. At the same time, fewer kids live in neighborhoods of concentrated poverty now than a decade ago, but it’s not because their families are faring better. Rather, as more affluent people moved into neighborhoods that once had high poverty rates, more poor children are finding their neighborhoods transformed into wealthier places. One way children could benefit from having wealthier neighbors is through an increasing tax base — if more affluent people live in the city, that means more tax money is coming in, which could potentially be used for schools and services benefiting low-income kids. Living in communities with affluent neighbors could also mean more amenities, better-resourced parks and increased transportation options, Rubenstein noted. “There are ways that more income diversity is better for all kids,” she said. But Rubenstein is quick to note that such increased income diversity hasn’t made a dent in how many kids are living in poverty; while the city’s median income has increased by 12 percent, “childhood poverty barely moved.” And for those families, paying for housing, food and healthcare remains a challenge. Perhaps a better way to measure how children are faring is by looking at a neighborhood’s median income, a figure that isn’t skewed by a few people making a lot or little money. In 2003, researchers with the non-profit RAND corporation examined the impact of concentrated poverty and concentrated wealth on kids in school. They found that children’s reading and math scores were more likely to be affected by how high or low a neighborhood’s median income is rather than whether they lived in neighborhoods with pockets of wealth or poverty.